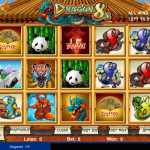 Dragon 8s is an Asian themed video slot game from Amaya Gaming. The design of the game is spectacular with the reels placed inside a pagoda. Chinese music can be heard from the moment you start playing the game. Everything we see in this game is of high quality that is probably due to the fact that this is one of the most competitive themes in the online slot world. There are not many features in Dragon 8s, but that is okay since we have a simple game in front of us. The lantern bonus symbols are the key to the main feature, the free spins round. To activate the feature you need to land at least 3 scatter symbols anywhere on the reels. Then you have to pick one of the six lanterns to reveal the number of free spins which goes between 4 and 7. And, pick one of the coins to reveal the multiplier that goes between x3 and x6. The wild symbol, which is the blue mask, is also worth mentioning here. It adds x2 multiplier to every win it contributes and it will also bring the highest payout in this game if you manage to land 5 on an active pay line. 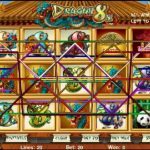 Dragon 8s is an interesting game to play. But then again everything that comes from Amaya Gaming lately is worth the try. The game play is straightforward and smooth and there are a couple of features to keep you busy. The design of the game is impeccable and appealing; especially with the nice sound effects that only complement the theme. We highly advise you to give this game a try, we are sure you will love it as much as we did. 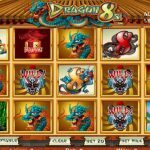 For an adventure like in the good old times consider playing Draco’s Fire a 5 reel slot by Amaya.